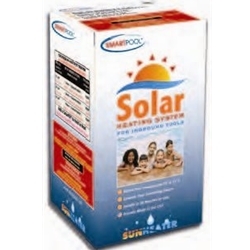 A SunHeater solar pool heating system will raise the temperature of your pool water by up to 10 F (6 C) or more. It is lightweight, durable and easy to install. Water simply flows through the SunHeater's many tubes via your existing pool pump where it is heated by the sun and returned to your pool. The system can be installed on the roof of your house, shed or cabana, mounted to a rack (optional mounting kit SK43 available), or simply placed on the ground. Get the system used by hundreds of thousands of Americans, the SunHeater solar pool heating system, and save money on fuel and electricity bills, extend your swimming season by weeks, and get more enjoyment from your pool than ever before.